We are excited and humbled by the massive support that the banting community of Zimbabwe has shown our new Double Cream Plain Yoghurt. We have always prided ourselves on making the best, and innovative products on the market. Our double cream plain yoghurt and greek yoghurt are perfect for banters because they are really filling and above all unsweetened. 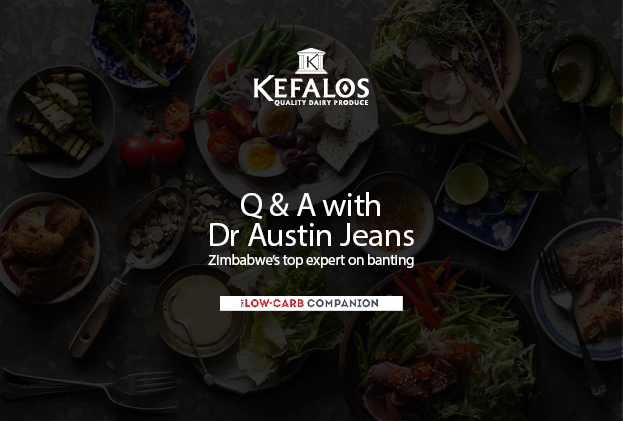 So to further cement our dedication to this fabulous group of people we managed to get an interview with Dr Austin Jeans: Zimbabwe’s leading expert on the low carb healthy fat diet. He will be helping us from here on end to produce a series of articles aimed just at banters. A short bio on Dr Jeans. Dr Austin Jeans is a sports medicine and lifestyle medicine physician in Zimbabwe. His scope of practice at the Centre for Sport & Exercise Medicine involves treating recreational and elite athletes in many different sports, exercise rehabilitation for sports and lower back injuries, and the use of lower-carbohydrate, higher-healthy-fat nutrition for the management of obesity, type 2 diabetes and sports nutrition. He is the author of The Low-Carb Companion, with the foreword by Professor Tim Noakes. Some of these answers were taken out of the Low-Carb Companion with the permission of Dr. Jeans. Q1.) Who should start banting? Everyone should try it out for overall health benefits, but specific populations should do it for disease reversal and control. These specific populations include people suffering from obesity, diabetes (type 2), and hypertension. It can also play a role in cancer therapy and significantly improve athletic performance. People with these diseases should discuss the options for a low carb healthy fat (LCHF) diet with a knowledgeable doctor or dietician. Q2.) What’s the best way to get started? Educate yourself (reading books) so you can make an informed decision to start. Once you’ve made your decision to start, clear out your pantry of junk and processed food, which are mostly sugar and highly carbs. Restock your pantry with low carb healthy fat options. Have a strong reason to do it because this is not a temporal fix. Q3.) Is a LCHF way of eating expensive? In relation to low-carb food costs, bear in mind that lower quantities of food are eaten with less frequency because of the lack of hunger. The long-term savings on health costs need to be considered as well. The costs of obesity, diabetes and heart disease are significant. Q.4) Are there any side effects? Some people may suffer from constipation (which can be countered by good tactics). They may also experience initial fatigue (2-3 weeks) because of the fuel switch over from carbs to fat. Tactics to avoid or minimise these effects are discussed in length in my book. Q.5) Is it hard to maintain a low-carb healthy fat lifestyle? People who want to get into this must first realize this is not a diet. It’s a lifestyle, which needs to continue forever to be successful. With that said, most conventional (low fat or low calorie) diets are hard to maintain because they are hunger inducing. A LCHF nutritional program when done correctly actually reduces appetite. Q.6) How many cheat days am I allowed? Ideally none. Cheating (eating refined carbs) can shut down your fat burning metabolism for 3-5 days. Cheating once a week will halt the fat burning process for up to a week and you will not lose weight. Q.7 How long will it take for my body to get used to the diet? Adaptation (fat adaption) to the dietary change does vary widely from person to person. On average it can take two to three weeks for inactive people to adapt, 3-6 weeks for early adaption in active people, and 3-6 months for complete fat adaption in highly active athletes. Q.8) Do I need to see a doctor or dietician to start? If you are overweight, but otherwise healthy and not on any medications, then you can start quite safely on your own, following a good LCHF program. If you are obese, type 2 diabetic, hypertensive, or have any kidney disorder, then it is advisable to first see a medical professional in the field of low carb nutrition. Q.9) What sort of restaurants can a person go to? Once you have a firm grip on what to eat you can pretty much go anywhere because you will know how to choose which food to eat. This goes on to knowing which places to avoid because you simply wont find any options for you. I have a full list of things to avoid eating in the FAQ section of my book but common things to exclude are vegetable oils, salad dressings, refined carbs (like white rice and potatoes) and desserts. Q.10) What Kefalos products can banters eat? Full cream unsweetened dairy products are recommended on a low carb healthy fat eating regimen. Kefalos products such as the Kefalos Greek Yoghurt, Kefalos Double Cream Plain Yoghurt and all the hard cheeses like the Kefalos Cheddar, Kefalos Feta, Kefalos Mozzarella and Kefalos Haloumi are all-great. Dr Jeans has kindly given us 3 signed copies of his book to giveaway to some of our lucky subscribers. All you have to do to stand a chance to win is to subscribe to our blog and you will be entered into a draw. The draw will be done on the 20th of May and winners will be announced on Facebook. You must be subscribed to win. To find out more about the book click here to visit it’s website. If you wanted to get a chance to try out a banting friendly restaurant. Dr Jeans recommends Sorellas pizzeria. We have managed to get some special vouchers exclusive for our readers. The voucher will give you 1 free coffee with any purchase of food. Especially now that it’s cold you can enjoy delicious banting friendly food with delicious Italian coffee. To request a voucher please send us a message through our contact page. 5 memes mums with toddlers will love →← What is beverage day? Glad you liked it. We really want to invest in our banting community which is a big part of our customer base. Linking up with Dr Jeans is just one of many thing we plan to do. Kefalos Greek yogurt and the double cream are the real deal for banting and LCHF lifestyle. Thank you so much for appreciating and supporting our products. We love all our banters and are happy we have a wide variety of products for them to enjoy. We love you guys we are proud to be able to have a product range that can support your lifestyle. Keep watching this space we have a lot more to offer. What an enlightening read please keep the articles coming, by the way where can I find kefalos shops in harare? Hey Tendeukayi. Thank you for reading our article and loving our brand. We don’t actually have a Kefalos store. We supply our products to all major supermarket retail chains and select few shops and outlets. your double cream plain yoghurt is sooooo delicious. happy and satisified banter.